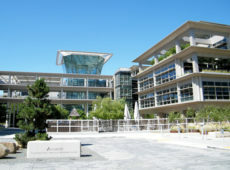 CalPERS headquarters, by Coolcaesar at Wikipedia, CC BY-SA 3.0, no changes made. Today, in yet another act of fiscal irresponsibility, the California Public Employees’ Retirement System (CalPERS) approved a list of 99 types of extra pay that can be used to calculate pension benefits for state and local government employees. The supplemental pay includes extra money that public employees earn when they briefly fill higher-paying jobs. The regulatory decision by CalPERS’ board will allow public employees hired after January 1, 2013, to increase their pension checks by including special pay in their pension calculations. For workers hired after this date, pension checks are calculated using a formula based on a worker’s age at retirement, years of service, and the final three years of salary. The list of approved supplemental pay includes higher pay for maintenance workers who replace street lamps from an aerial bucket, school district employees who supervise kids during recess, librarians who provide direction or resources to library patrons, and policemen who are good marksmen. Aren’t all cops expected to be good shots? Aren’t all librarians expected to assist the public? These pay supplements are largely scams to grab more taxpayer money. And CalPERS’ decision to officially recognize these supplements for the purpose of calculating pensions undermines the 2012 pension reform law PEPRA, which disallows “ad hoc” payments being used to calculate benefits. The law states that pensions must be based on “the normal monthly rate of pay or base pay.” This language was intended to end “pension spiking” – the practice of boosting “pensionable” income using supplements such as overtime pay, unused vacation pay, allowances, and bonuses. The intent of PEPRA was to end these spiking shenanigans, but CalPERS is now attempting an end-run around the reforms by authorizing higher pensions through pay upgrades, which employees can manipulate in the final years of their service. Unfortunately, this type of fiscal irresponsibility is routine for CalPERS. In 1999, CalPERS’ board told the state legislature and Gov. Gray Davis that a generous pension increase bill, SB 400, could be implemented “without it costing a dime of additional taxpayer money.” The board claimed that “superior” stock market returns would cover the additional cost of the higher benefits for at least 10 years. Relying on this “expert” opinion, the legislature overwhelmingly passed the bill and Davis quickly signed it into law. But CalPERS’ claims about SB 400 were quickly proven wrong, and the benefit increases blew a massive hole in CalPERS’ finances, which persists today. The Sacramento Bee analyzed data from CalPERS’ internal annual reports and found the average first-month pension payout for new retirees doubled between 1999 and 2012. CalPERS’ deputy chief actuary David Lamoureux has attributed at least 20 percent of the payment increase to the 1999 benefit enhancements alone. CalPERS has proven to be a partisan political player, advancing public-employee interests instead of acting as an unbiased servicing agency—its true mandate. Today’s decision adds to CalPERS’ credibility gap when it comes to managing the pension fund with integrity and responsibility. CalPERS’ new regulation is pension spiking by another name—“supplemental pay.” The governor and legislature must act swiftly to stop this abuse. If not, CalPERS will saddle our children and grandchildren with even more immoral pension debt, this time to pay for new pension spiking. Update: My book on the California public pension crisis, California Dreaming: Lessons on How to Resolve America’s Public Pension Crisis, will be released in May 2015!